The latest issue of Marketing Eye Online features a story about outlaw fashion. There have been several times in recent history when furyou (bad boys, outlaws) have set the tone for the times. Many people in Japan will recall the “Yankees” of the late 1970s and early 1980s. 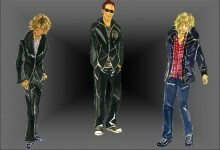 Now, once again, bad boys are popping up as popular figures in manga and film and trendsetters in fashion. But the new “bad boy” styles are spreading in part because they have been diluted by non-bad boy elements. The classic waruwaru “bad, bad” type in whom the old “Yankee” attitudes are alive and well. He is very particular about his clothes, brought up highly conscious of superior-subordinate relationships. He may look bad, but he is highly respectful of tradition. He is a brand loyalist; not the sort of flighty customer who changes his look with every passing trend. The itachi (Italian?) bad boy is epitomized by the gigolos employed by Kabukicho host clubs. He is smart, stylish, girlishly thin. He sees his body as a weapon and wears suits that emphasize his slimness. He may seem to treasure women’s feelings, but be fiercely ambitious on the inside. The chara bad boy is a mix of wildness and the sort of feminine taste found at Shibuya 109. He skillfully combines trendy items and hair styles. He is open about his desire for women to like him.